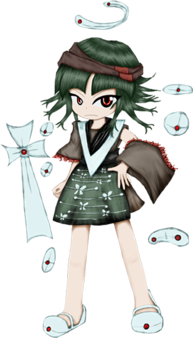 Para (パラ) is the soul of the homunculus whose body Taira no Fumikado now inhabits, now residing in Fumikado's original body. They are the Stage 5 boss of the Haze route in Brilliant Pagoda or Haze Castle. Para has the ability to extract knowledge from any source, but with certain drawbacks. They can only withdraw a limited amount at a time, and the difficulty of doing so depends on the amount of knowledge within the source. The more knowledge there is, the more difficult the task is. Their known name is Para (パラ), although it's unknown if it's their real name. JynX was asked if there are any special meanings in their name, but they responded with "you can theorize away!". A possible origin for their name may be derived from Paracelsus, a Swiss alchemist of the German Renaissance who first theorized an outline for creating a homunculus. It may also be a short-form of "parapara" (パラパラ), an onomatopoeia meaning "flipping through a book", as suggested by Rei's Twitter. According to JynX, "Para" is written as "帕拉" in Chinese, which is a phonetic translation of Para. 帕拉 is Chinese for the State of Pará, Brazil, Pala, Chad and an abbriviation of the Tibetan nobel family name, Pajo Lhakhang (page in Chinese). 帕 can mean "to wrap" or "hankerchief", and is also the short form of "Pascal"; 拉 can mean "to pull", "to haul", etc. Chouki was the one who removed the seal on their body, reawakening them. As an expression of gratitude, Para serves under them. Their soul inhabits Fumikado's original body, as Fumikado's soul is in their body. Para resents Fumikado for sealing their body away after the procedure.